It had been a few years since World Surf League held a qualifying contest for the US for longboard, which means that no US long boarders have had the opportunity to qualify for the World Longboard Tour, which currently consists of only two contests. We'd talked about attending the next contest in hopes that Brandon could re-qualify, but up until a few weeks ago, we were told that there wouldn't be any contest. We got word from WSL just less than a month before the set date that there would be a QS event at Malibu for both men and women, and at the worst timing possible, we decided that no matter what, we were going to be there. We came up with ways to make a few bucks at the last minute, tried to find sponsors, and postponed paying bills because who needs electricity if you're not home, right? Brandon sold a few paintings, I picked up a few promo jobs, requested my paycheck early, took a few donations from friends and family and took three weeks off work and left! We loaded the cat and took her to stay with my Grandma, and carried on westward, leaving Wednesday morning. We only stopped to refuel and although the plan was to sleep in the back of the car, Brandon decided that he'd just keep driving while I slept. Sometime around 5 am on Thursday morning, he decided that I could take over... So I did. In less than ten minutes I was being pulled over for speeding: 90 in an 80. In Florida, that never would have been an issue, but apparently in Texas, it's a big deal. It's always difficult being around someone 24/7, but when you're trapped in a car, matters are worse, so I took every opportunity to extend our time outside the car every chance that I got, especially since Brandon was dead set on driving straight through. 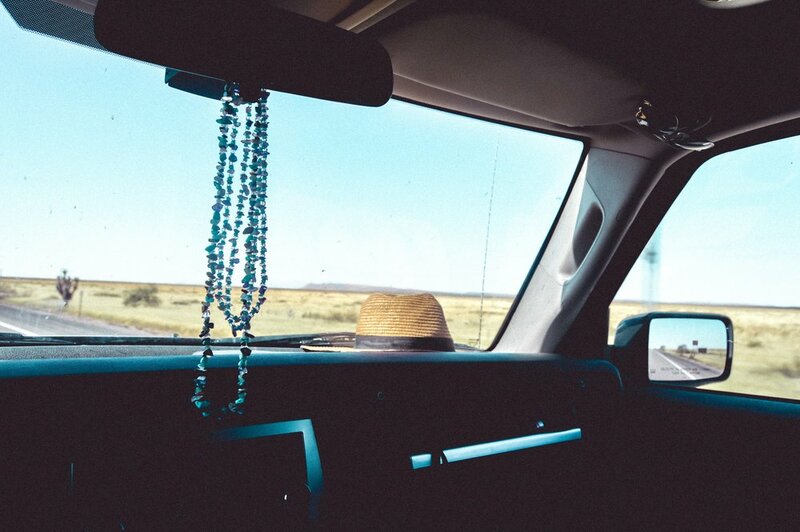 I'd hoped to take three days to get to California, sleeping at night, and maybe even hitting a few stops along the way, like the Alamo or Joshua Tree, but it was clear that wasn't his plan. Brandon slept in the back for quite a while while I finished the drive through Texas and on through New Mexico, snapping photos through the dirty windshield from the drivers seat. Somewhere in the desert, there were multiple facilities in a row with insane amounts of what appeared to be dairy cows. I swear I may never have dairy again. In some places, cows were packed in, side by side, standing in the hot sun with no shelter. Occasionally, I'd see a cow or two standing out by the road, head stuck out of the fence, as though it was just desperate for help. I knew that there was obviously nothing that I could do, except for to stop supporting this animal abuse. It was hard to see. We spontaneously decided that if we drove straight through, we might miss a few neat experiences, so on a whim, we swerved for the next exit and decided to play tourist. We took a little square tunnel under I10 and went straight to the "Historic Trading Post" (I don't actually know what it was called. I'm just reading the sign in the photo.) to see if we could find some inexpensive things we couldn't live without. I'm generally not one for souvenirs unless it's something really unique that I can use. I opt for collecting photos or rocks. "Woah! A teepee!" We pulled into the dirt parking lot, drove past the building, and went straight to this old, run-down wooden teepee. The inside was graffiti'd, but how, I'm not sure. I couldn't help but wonder why anyone would even be out there. I mean, this place was literally in the middle of nowhere. What kids are hanging out in the desert and want to write on the inside of a wooden teepee? In the front of the shop was an old Buick that I just had to feel up. Old cars are a thing of mine. Of course, on the inside was a fake skeleton wearing some tourist shirt, leaned against some Mexican blankets. I admit, I had the urge to throw him out of the car, get in, and tell Brandon to push me to California so we could get this thing running. 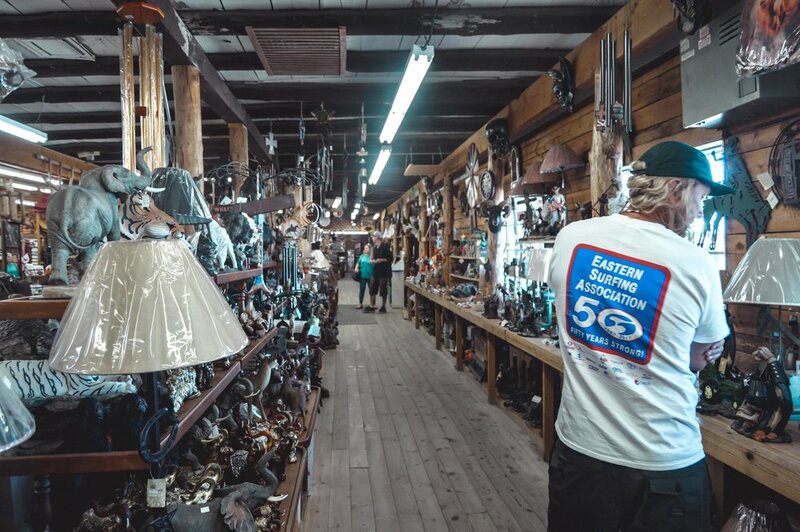 Like any tourist shop off the side of a major highway, there are area-appropriate, "Made in China" goods, marked a fair bit higher than what they were initially purchased for, alongside a few classy pieces of locally made Native American art. Considering that my Grandpa had made the trip out west several times in his VW bus and collected all of the coolest handmade pottery pieces and Mexican blankets, all of which I inherited, I kinda felt like the work had been done here! The first thing I said when we decided to drive to California was that I wanted to see the huge Saguaro cacti. They live to be hundreds of years old, and they grow to around 40 feet tall. I knew that somewhere in the desert there were a lot of these all in one remote area with not a lot else around them. Brandon quickly agreed, "Oh yeah, we'll go through the cacti." So I waited... and waited... and watched out the window. "Are you sure we didn't pass them in the night?!" "Are you sure they're on this road?!" "Are you sure they even exist?!" By the time we finished off the second day of driving, I was sure that we wouldn't see them. We pulled off at a rest area in the middle of nowhere and decided to explore a little bit. Brandon had a beer and I walked around with the Olfi camera, hoping to run into a coyote, but instead just found holes in the ground that were no bigger around than a diamond back rattle snake. We sat for a few minutes and then decided to go up the road just a few minutes to the next rest stop, which was an actual rest stop with lights and bathrooms, and sleep in the back of the Jeep for the night. Other than nearly freezing to death, that went fairly well. We woke up really early and got back on the road, hoping to arrive on the coast of California within just a few hours. The early morning air was cold, and there were mountains up ahead. In just a few short hours, we'd be on top of those mountains, and overlooking the Pacific Ocean in the distance. In the mean time, we had plenty of weird little desert towns to go through that smelled of cow manure and that weird smell that you smell when you first get on an airplane. If I lived in those towns, I'd not only have a headache around the clock, but I'd smell like a cow. I can't imagine a life like that. And then I'd look out, and all I'd see would be desert and mountains, and I'd be entertained by things like tumbleweeds and looking for goats on rocks, which may or may not even be a thing in the US. I'm still not sure. Just before the mountains were solar fields and massive areas of wind turbines. I've seen smaller ones, but these guys were absolutely massive, and there were so many of them for miles and miles. I'm convinced that they're running the entire state of California on those things. Soon enough we were paying top-of-the-mountain gas prices and then driving through San Diego.